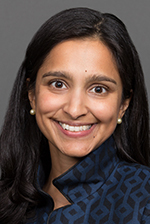 Sukanya Soderland is Chief Strategy Officer and Senior Vice President for Blue Cross Blue Shield of Massachusetts, the largest private health plan in Massachusetts and one of the largest independent, not-for-profit Blue Cross Blue Shield plans in the country. The company serves nearly 3 million members and is rated among the nation’s best health plans for overall member satisfaction and quality. Sukanya, in partnership with the company’s management team, is responsible for developing strategies that will drive Blue Cross’ overall direction and achieve the company’s business goals. She also leads data analytics, business performance and process improvement, and innovation. Sukanya joined Blue Cross in 2018. Prior to joining Blue Cross, she was with Oliver Wyman, a leading international management consulting firm, since 2000. She served as a senior partner in their Health and Life Sciences Practice, helped found the Oliver Wyman Health Innovation Center, and was the lead health care partner in Oliver Wyman’s Digital, Technology, Operations & Analytics Practice. Recognized as a national thought leader in health care, Sukanya is a frequent speaker and contributor at industry events and forums. Sukanya has an MBA from Harvard Business School and a bachelor of arts degree from Harvard College.